Sawdust City offers wood framed mirrors! We can custom make a wood framed mirror to your measurements! 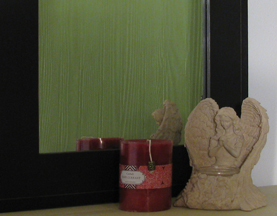 Use your wood framed mirror anywhere in your home, or send one with your college student to liven up their dorm room! It's handy to have a wood framed mirror in the mudroom, hall way, bedroom, kitchen, and bathroom! Choose from any of our colors for your frame, and make it solid or old to fit your style, but don't miss our beautiful rustic pine wood framed mirror! Choose to add optional lettering to the frame for a truly unique mirror! Our smallest wood mirror looks great with the wood frame! It makes a lovely accent mirror. Choose from our optional lettering to make the perfect unique wood wall mirror. Features: Overall dimensions: 14" W x 0.75" D x 14" H Mirror is 8" x 8"